Place the chicken in a pot and cover with water, bring to a boil, reduce the heat to medium and cook till chicken is cooked through. Remove chicken (save broth). When cooled enough to handle remove the chicken from the bone and shred, set aside. Whisk together the soup, broth, milk, flour, salt and pepper. Unroll the crescent dough and separate into the triangles. 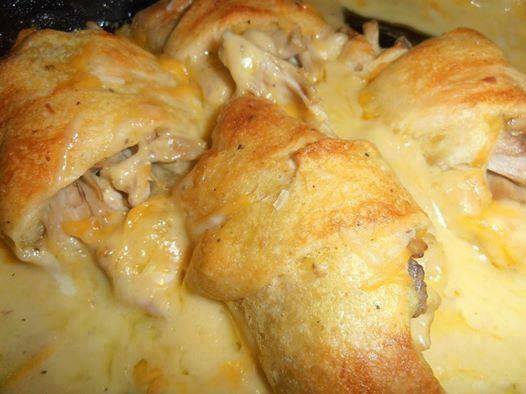 Place a little cheese over the dough and at the larger end place a good heaping of the chicken. Roll up and place in a 9x13 casserole dish. Repeat with remaining. Once all are in the dish, pour the soup mix around each one and then drizzle a little over the tops (not too much). Bake in a 375 degree oven for 25 minutes, remove and top with a little more cheese and return to the oven for 5 minutes. Let sit for a couple of minutes before serving, the soup mixture will thicken up like a gravy.